Now is the peak season for delicious winter squash! Winter squash is an excellent source of antioxidants including carotenoids, Vitamin C, and Manganese. In fact, for many countries no single food provides better alpha-carotene and beta-carotene support. Low-fat omega-3s make this colorful ingredient a valuable anti-inflammatory, so important for cancer prevention, without increasing your total fat intake! Less than 15% of the its calories come from fat. This vegetable also aids insulin regulation, helping to prevent type 2 diabetes. 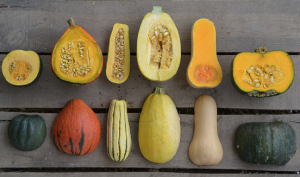 Remember to only choose the organic variety when selecting a winter squash as it can be an effective intercrop for rehabilitating contaminated soils. Certified organic varieties are far less likely to contain contaminants like polycyclic aromatic hydrocarbons (PAH). 2. In a large bowl toss the squash with oil, spices, and salt. 3. Place squash wedges on baking sheet lined with parchment paper. 4. Bake 25 minutes turning half way through baking time. Serve on the side of one of our delicious cancer-fighting entrees or bring as a healthy and delicious side for your family’s Thanksgiving dinner!